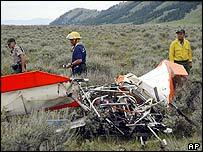 John Walton, son of the founder of the US Wal-Mart retail chain, has died when his light aircraft crashed in Wyoming. No-one else was aboard the plane piloted by the 58-year-old billionaire, which crashed shortly after take-off from Jackson Hole. 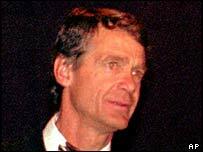 Walton was the world's 11th richest person, worth in excess of $18bn (£10bn) according to Forbes magazine. Wal-Mart is the largest retailer in the world, and was founded by John Walton's father Sam. Walton was a member of Wal-Mart's board, although he did not work for the company. The incident occurred at about 1220 local time (1820 GMT), Grand Teton National Park spokeswoman Joan Anzelmo said. So far the reason for the crash is not clear, but the spokeswoman said Walton was an experienced pilot and the weather conditions were good. He was flying a home-made aircraft, with wings of heavy-duty fabric stretched over an aluminium frame. "This was an experimental, very lightweight aircraft," Ms Anzelmo said. Walton was an army veteran who served with the Green Berets as a medic during the Vietnam War. He was awarded a Silver Star for saving the lives of several members of his unit while under enemy fire, according to Wal-Mart. Throughout his life he pursued a variety of business interests, including crop dusting and boat building. Walton is survived by his wife and their son.